Star Trek: Discovery is the sixth live-action Star Trek TV series, and began airing in September 2017. This page will keep note of all the key information about the series, with links to more information from coverage on The Trek Collective, as well as details of tie-in products related to the series. 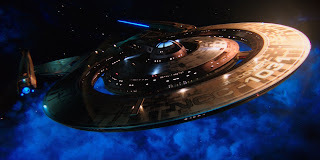 The series is set in the prime timeline (that of all the previous TV series, rather than the alternate reality of the current film series), about ten years before The Original Series, during in a war with the Klingons. The main setting is the starship USS Discovery NCC-1031, an experimental design which utilises a revolutionary spore drive, allowing for near instantaneous travel across the galaxy. 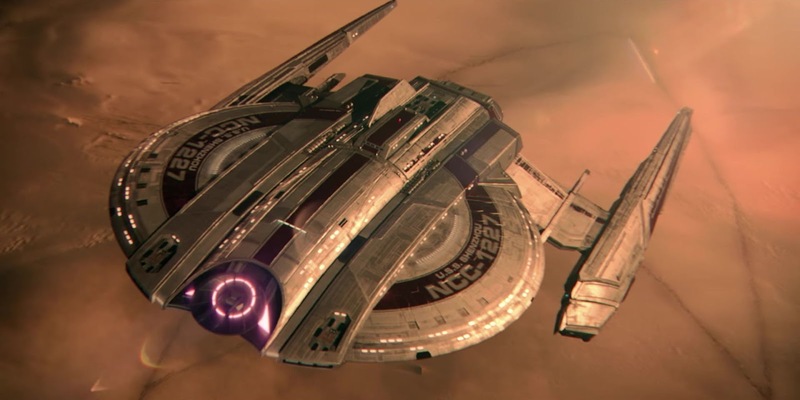 The first two episodes however were set aboard the USS Shenzhou. 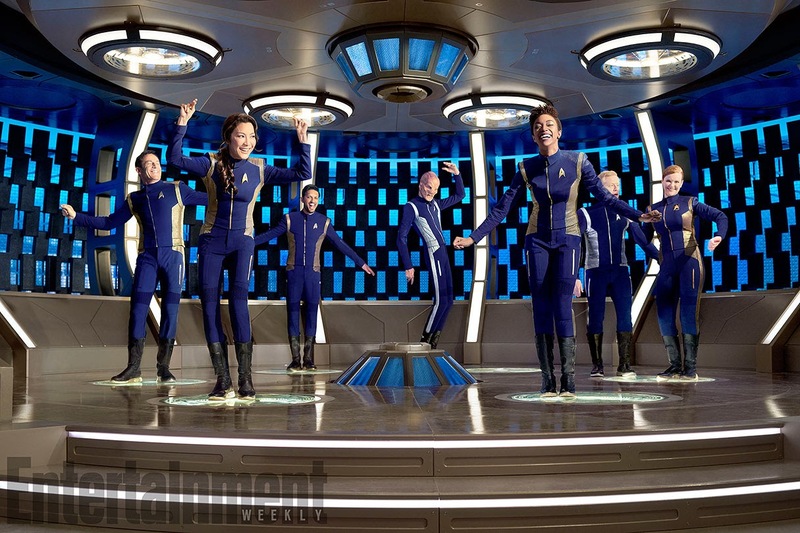 This is because the series is focused around the life of the character Micheal Burnham, rather than a particular ship and crew, so the story follows us her. Additionally Klingons are point of view characters in the series, appearing in many episodes, and several episodes take place entirely in the mirror universe. The series focuses on the character Michael Burnham (Sonequa Martin Green), a Human who was raised by Sarek of Vulcan and his Human wife Amanda (the parents of Spock) after being orphaned. Throughout the series she struggles to find a balance between her Human instincts and Vulcan upbringing. We meet Burnham as first officer aboard the USS Shenzhou, but after attempting a mutiny Burnham looses her position in Starfleet and is sentenced to life in prison. Never the less she is later recruited to the USS Discovery during in the Klingon war, and begins a path to redemption. The Shenzhou is captained by Philippa Georgiou (Michelle Yeoh), a character who has great impact on both Burnham, and Saru (Doug Jones), the ship's science officer, who later has become first officer of the Discovery by the time Burnham joins that ship. Saru and Burnham have a collegiate but adversarial relationship, with Burnham's mutiny making him distrustful of her later. 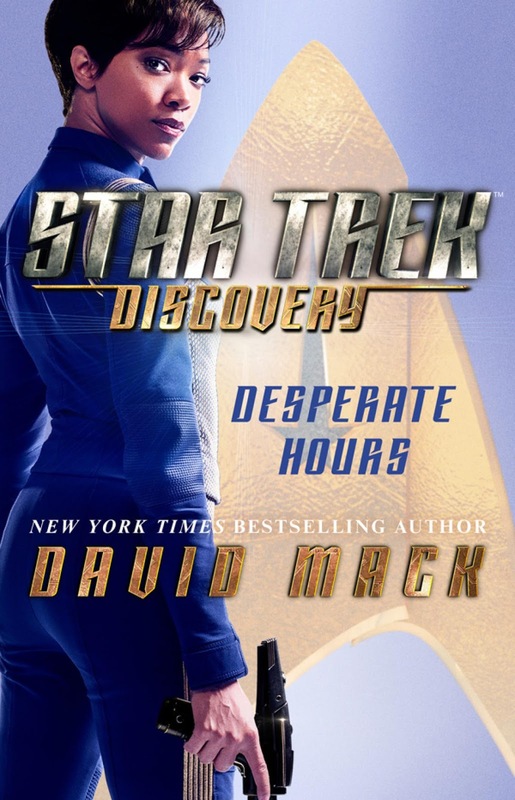 Other main characters on the Discovery include the morally ambiguous Captain Gabriel Lorca (Jason Issacs). Highly focused engineer Paul Stamets (Anthony Rapp), and his partner Doctor Hugh Culber (Wilson Cruz). Enthusiastic and ambitious Cadet Sylvia Tilly (Mary Wiseman), who is Burnham's roommate. And Ash Tyler (Shazad latif), the chief of security, who joins the ship after being liberated from Klingon imprisonment. The Klingons play a significant role in the series, and are often point of view characters. We are first introduced to T'Kuvma (Chris Obi), a messiah-like figure who seeks to unite the Klingon houses against the Federation. It is his followers L'Rell (Mary Chieffo) and Voq (Javid Iqbal) who become the main Klingon characters however, as well a competitor for Klingon leadership, Kol (Kenneth Mitchell). Sarek (James Frain) and Amanda (Mia Kirshner) also feature in the series, as does another classic TOS character, Harry Mudd (Rainn Wilson), who appears in two episodes. Admiral Cornwell (Jayne Brook) is also a significant recurring character. The first season will run for fifteen episodes - See Discovery episode listing for full details of each episode. The second season is currently expected to be thirteen episodes. The first season is split into two blocks, with the first nine episodes forming a mini-arc, released in a block starting from September 2017 - Within that the first two episode very much form a unique story that works as a prologue to the rest of the series. The remaining six episodes, dubbed chapter 2, were released starting in January 2018. ...with each episode being a chapter of that novel, and within that chapter there's a beginning, middle and end. We will have episodes that exist by themselves but are a part of a much bigger story. In the US the first episode aired on the CBS Television Network, but subsequent episodes are available exclusively on the the CBS All Access on-demand streaming service (which is also available via Amazon Channels), released weekly. Netflix stream the series in almost every other country in the world (188 in total), within 24 hours of US release. Canada is one of the few countries not covered by the Netflix deal, where the series will be available on Bell Media channels and streaming services, also released simultaneously with the US - The only country so far where episodes are are aired on traditional TV channels. There are currently no arrangements for distribution in China, Syria, North Korea, and Crimea (the only territories Netflix does not cover). Physical media home video releases have not yet been announced, but a special DVD set was distributed for Emmy nomination review. Teaser trailer - Previewed the logo, alongside some generic space shots. The trailer promised "New crews, new villains, new heroes, new worlds". Teaser trailer 2 - Introduced the series ship, the USS Discovery. The final design was revised significantly after this trailer was producer. Series trailer - First full series trailer, based on the first two episodes. Comic Con trailer - Second full series trailer. including some footage from later episodes. Season trailer - Released after the first two episodes aired, previews many episodes in the first half of the season. Alongside the release of the main show there is also a dedicated behind the scenes show, After Trek, aired after each episode, with interviews with cast and crew and behind the scenes features. Titan Books have so far released two behind the scenes companions to the series: The Collector's Edition, and The Making of Season 1. First look at the captain's chair design. First behind the scenes video. Comic Con exhibition concept art and costumes. Klingon and Starship panels at Star Trek Las Vegas - Concept art and panel discussion. Set tour videos - Including details of the Discovery sets and timelapse of the Shenzhou set being built. Props behind the scenes video. Behind the scenes videos - On sets and location work, and Burnham. Behind the scenes videos - On costume design, Sarek, and Captain Georgiou. USS Shenzhou - Concept art and behind the scenes photos and video of Shenzhou sets and costumes. Starship concept art and prop photos. John Dickenson concept art - Including Klingon starship and weapon designs. Magic to Make the Sanest Man Go Mad - Episode specific collection, including Andorian helmet design. Behind the scenes photos - From various chapter one episodes. Starship renderings by Pierre Drolet. Starship renderings: Worker bee, USS Eddison, Klingon Bird of Prey. Alien makeup: Tellarite, Andorian, Orion, Osnullus, Tardigrade, Shenzhou crew. Jeff Russo music behind the scenes video. Unused soundtrack by Cliff Eidelman. Tie-in fiction releases based on the series are being closely coordinated with the writers room, giving an unprecedented level of fidelity, and even feeding back into the TV production itself. Series writer and Voyager novelist Kirsten Beyer is coordinating the tie-in fiction efforts. Four novels have so far been announced, all of which are prequels, set between one and ten years prior to the main events of the show. Two are set on the USS Shenzhou, and one earlier. Several comic miniseries have also been released. The first, The Light of Kahless focused on T'Kuvma and the Klingons. This will be written by Mike Johnson and Kirsten Beyer, with art by Tony Shasteen. Discovery ships and characters have also been integrated into the Timelines video game - See, various, trailers. Discovery uniforms and ships are also available in Star Trek Online. The soundtracks from the series are published by Lakeshore Records, with two albums planned for the first season. Season 1, Chapter 1 was released digitally in December 2017 (see: excerpts), and a second chapter followed in April 2018, featuring music from the remaining episodes. CD releases of each chapter followed slightly later than the initial digital release. Addition there will also be a vinyl soundtrack, featuring a selection of music from both chapters. Eaglemoss have launched a Discovery spinoff from the popular starship model and magazine series The Official Starships Collection. The Discovery series features larger models than the previous series, released monthly. See full details on the Discovery Starships Collection list page. Anovos have also launched a range of model ships, but much larger and more detailed studio filming miniature style models. 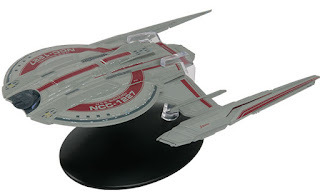 So far offering the USS Discovery, USS Shenzhou, and USS Enterprise. 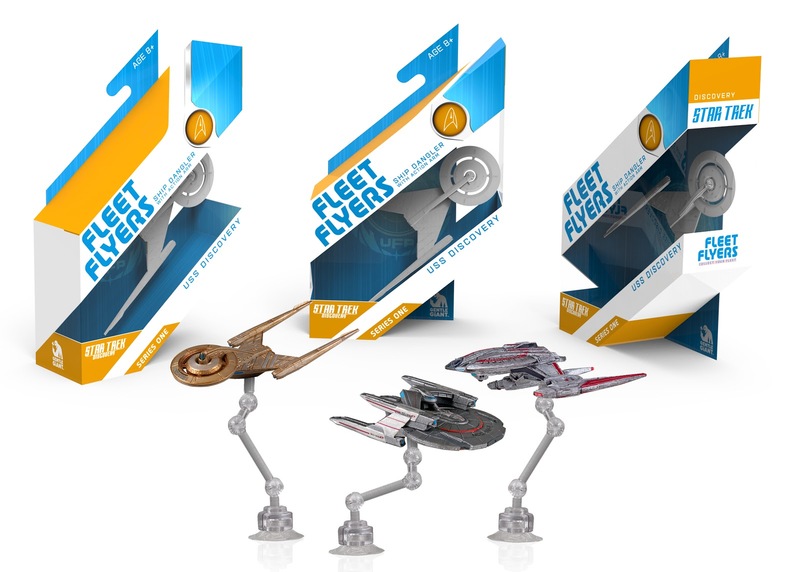 At the other end of the scale, Gentle Giant Toys are planning of series of smaller starship models called Fleet Flyers. McFarlane have announced plans for a range of action figures and role-play props based on the series. 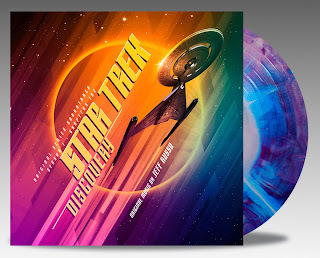 StarTrek.com offer a variety of Discovery apparel, and Trevco have a range of T-shirts, including sublimation print costume designs. Meanwhile Anovos have announced a range of screen-accurate uniform replicas, and a phaser replica. Rubies are expected to launch a more affordable costume range too. QMx offer replica insignia badges. If you don't want to dress up yourself, you can also get life-size standees of several characters. Bye Bye Robot have produced a range of art prints, by several different artists, depicting ships and characters from the series. 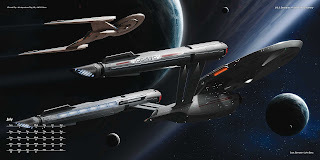 Other art prints are available from StarTrek.com. 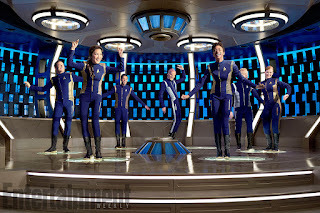 Perth Mint have released the first coins based on the series, depicting Michael Burnham and the USS Discovery. FanSets offer a large range of collectable pins based on the series, including designs based on ships and characters, plus a pin for every episode in their EpisodePins range. Discovery in the Ships of the Line 2019 calendar. There are two Discovery 2018 calendars, from Universe in the US, and Danilo in the UK. A 2019 calendar has also already been announced, and Discovery images will also appear in the 2019 Ships of the Line and Weekly calendars.